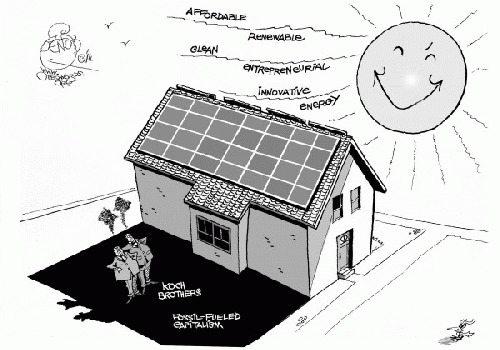 Lobbyists funded by Charles and David Koch want to punish homeowners for installing solar panels on their own roofs. Hypothetical conundrums can provide valuable learning experiences for students of corporate management and ethics. Consider this one: Suppose you're a corporate chieftain who's a free-enterprise fundamentalist, despising government regulation, taxation, and intervention in the purity of the holy marketplace. But -- whoopsie daisy -- suddenly a new competitor to your old-line product pops up, and more and more of your customers are switching to the alternative. That's the conundrum: You're being out-competed. What else can you do besides try to compete better? Well, if you're the reigning princes of anti-government extremism, you find that something else. This is no hypothetical situation. It's a real one faced by the Koch brothers, the fossil-fueled duo. They feel threatened by the steady increase in the number of middle-class families installing solar panels on the roofs of their own homes. Not only is this free, non-polluting sun power slashing families' utility bills, but families can also make money from this investment in climate solutions. Today's efficient solar cells can produce more electricity than a home needs, and 43 states allow these rooftop energy producers to sell their excess production back to the grid. It's free enterprise at its most free-and-enterprising best. Naturally, the Kochs and the utility monopolies hate this trend. That's why these old-power behemoths are tossing their libertarian purity overboard and sending their lobbyists across country: to demand that state governments intervene in the marketplace to stop these pesky rooftop competitors from, uh, competing in the energy marketplace. Their hypocrisy doesn't stop there. They also want states to tax solar-powered homeowners to punish them for becoming innovative energy producers with some independence from their local utilities. It sure isn't the American way. But it is a page from the corporate playbook. As the comedian Lily Tomlin says, "No matter how cynical you get, it's almost impossible to keep up."